When you need a break from the madness of Marrakech this is the best place to stay. Café Arabe has a very elegant dining room on the ground floor and an unforgettable terrace on the top floor with view on the city. They will be happy to adapt in a vegan style the tasty traditional Moroccan dishes for you. The service is very attentive and the style is truly genuine. 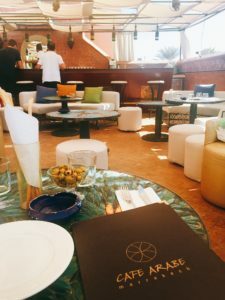 They welcome you with breadsticks and olives and they will be happy to adapt in a vegan style the tasty traditional Moroccan dishes for you. You deserve your peaceful Vegan break.